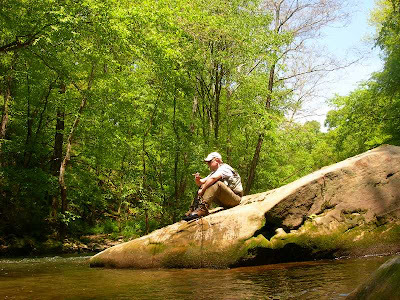 I would like to take this opportunity to thank my close friend and ANF fishing liaison, JDM for guiding me through the maze of uncharted streams and leading the stress relieving hikes to unexploited territory just a stone's throw away in neighboring Pennsylvania. 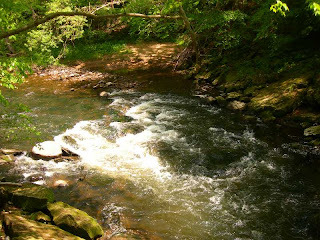 Our trips to the Allegheny National Forest and several other forest systems within the beautiful state of Pennsylvania will always be cherished and never forgotten! I would also like to thank James for several great contributions to my Trout Adventure's page. 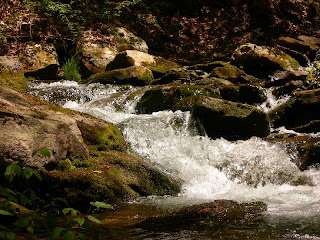 If you have an adventure to share that involves hiking, camping, wilderness trekking, trout fishing or any combination of the four...please feel free to contact me for inclusion in this section! The curiosity can really get the best of me. What starts as a harmless, thin blue line on a map rapidly turns into an obsession. There are questions that must be answered. Will there be trout? If there are, will they be plentiful? Will there be any size to them? Will the stream have good structure? Does the stream see much pressure? Of course the only way to accurately answer these questions is to journey to that thin blue line. 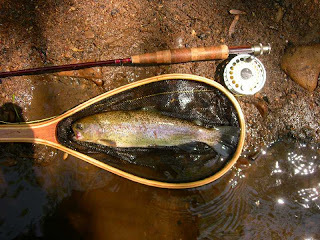 If all goes well the trout are present and willing to show themselves. The stream will be more beautiful than you hoped. And if you are really lucky, there might just be an absence, or at least minimal numbers, of human foot prints. I was dead set on hitting a new stream last weekend. Unfortunately, obligations took over my Saturday and Sunday afternoon. I thought Monday was going to see worse weather than it did so Sunday morning was my only shot. So, Sunday morning I grabbed my gear and headed out. After spending some time trying to find the correct unmarked forest road I finally arrived. The stream is away from the nearest road by at least a mile so it can’t be viewed from the road. After departing from my Jeep and walking for a short while in what should be the right direction I finally heard running water. I was in the right area. When you get into a hurry you can make mistakes. My mistake was not bringing a topographical map. I had a forest service map with me but that only told me where the stream was. What the service map did not tell me was that I was soon to be traveling down a nearly vertical gorge. If you are going to go searching out wild trout streams always bring a topo map. It will let you know the easiest way into an area and can save you a lot of trouble. After making the descent I could not have been more pleased with what I found. 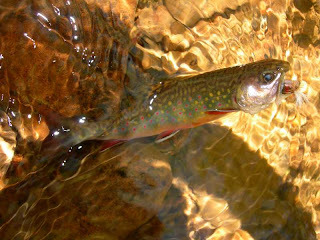 The stream was full of deep pulls, log jams, and everything else you could ask for in a brook trout stream. The stream offered plenty of places for fish to hide. Here’s one of the photos I took while I was there. Unfortunately I was so focused on fishing I forgot to take many photos. 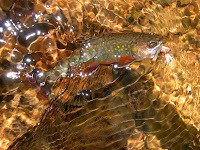 I hiked down to the mouth of the stream and then fished my way up into the headwaters catching numerous brookies along the way. All fish were caught using a size 14 Royal Wulff. Most of what I caught was on the small side but I did see a few nice ones. Having limited time to fish I was not proceeding nearly slowly enough and certainly did not fish the stream for all it was worth. 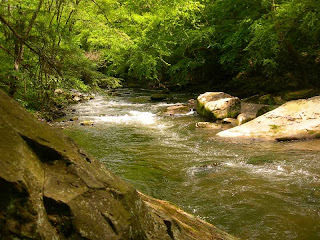 However, I satisfied my curiosity with the stream and will be back to fish it again. Monday I planned to catch up on some of school work for the week ahead. I woke up, looked at the textbook setting on the desk, and then proceeded gather my fishing gear and head for Neshannock Creek. The weather was far too nice to stay home. So much for the forecasted thunderstorms. I arrived to find the water very clear but with good flow. The stream was in great shape. Although there were several types of insects coming off the water the fish were not in the rising mood. I don’t think there was enough of any one type of insect to get things going, and the insects were appearing at random. I gained a fishing buddy during the day. I first noticed the snake when I looked down and it was at my feet. The snake must have crossed in front of me 4-6 times before it stopped to sun bathe on the rocks not more than ten feet from where I was fishing. The fish were feeding in deeper water but offerings did not need to be dragging on the rocks. I fished at approximately ½ - ¾ the depth of the water. I started with nymphs but moved on to streamers. 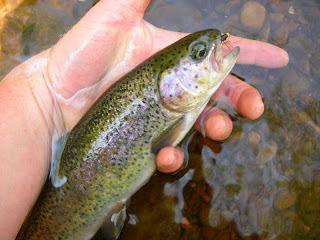 Size 8 bead head olive Woolly Buggers were the hot fly of the day. I ended up catching quite a few fish in the couple hours I was there. A few nice heavy ones too. All fish caught were rainbows. I hope you enjoyed the report. I enjoyed living it.